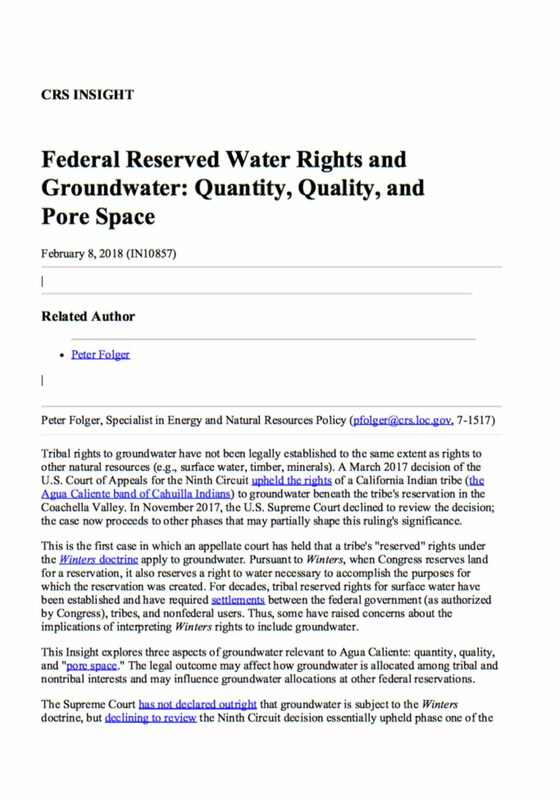 This is the first case in which an appellate court has held that a tribe's "reserved" rights under the Winters doctrine apply to groundwater. Pursuant to Winters, when Congress reserves land for a reservation, it also reserves a right to water necessary to accomplish the purposes for which the reservation was created. For decades, tribal reserved rights for surface water have been established and have required settlements between the federal government (as authorized by Congress), tribes, and nonfederal users. Thus, some have raised concerns about the implications of interpreting Winters rights to include groundwater. Although the federal government has authority to regulate water, it typically defers to the states to allocate water resources within the state. The federal government maintains certain federal water rights, though, which exist separate from state law. In particular, federal reserved water rights often arise in questions of water allocation related to federal lands, including Indian reservations. Indian reserved water rights were first recognized by the U.S. Supreme Court in Winters v. United States in 1908. 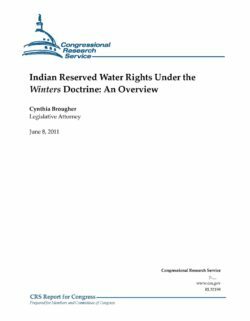 Under the Winters doctrine, when Congress reserves land (i.e., for an Indian reservation), Congress also reserves water sufficient to fulfill the purpose of the reservation. As the need for water grows with the development of new industries and growing populations, the tension arising from the allocation of scarce water resources highlights the difficulties that often surround reserved water rights, particularly in the western states. 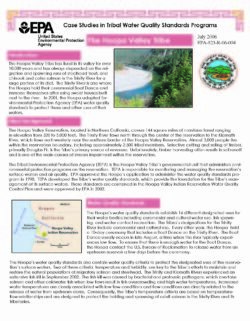 Western states generally follow some form of the prior appropriation system of water allocation. The prior appropriation system allocates water to users based on the order in which water rights were properly acquired. Because Indian reserved water rights date back to the government’s reservation of the land for the Indians, these water rights often pre-date other water users’ claims. Although the prior appropriation system’s reliance on seniority provides a degree of certainty to water allocation, Indian reserved water rights may not have been quantified at the time of reservation. Because Winters did not dictate a formula to determine the quantity of water reserved, courts apply different standards to quantify tribal reserved water rights. As a result, other water users may not know whether, or the extent to which, Indian reserved water rights have priority. Because of these uncertainties, Indian reserved water rights are often litigated or negotiated in settlements and related legislation. This report will examine the creation of Indian reserved water rights under the Winters doctrine. It will analyze the scope of the doctrine, including the purposes for which the water right may be claimed and the sources from which the water may be drawn. It will also discuss various quantification standards that courts have used in attempting to clarify Indian reserved water rights. Finally, it will examine the effect of the McCarran Amendment, through which Congress extended jurisdiction to state courts to hear disputes involving Indian reserved water rights. 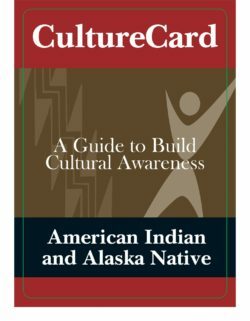 In the second half of the 19th century, the federal government pursued a policy of confining Indian tribes to reservations. These reservations were either a portion of a tribe’s aboriginal land or an area of land taken out of the public domain and set aside for a tribe. 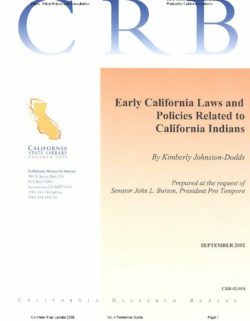 The federal statutes and treaties reserving such land for Indian reservations typically did not address the water needs of these reservations, a fact that has given rise to questions and disputes regarding Indian reserved water rights. Dating to a 1908 Supreme Court ruling, courts generally have held that many tribes have a reserved right to water sufficient to fulfill the purpose of their reservations and that this right took effect on the date the reservations were established. This means that, in the context of a state water law system of prior appropriations, which is common in many U.S. western states, many tribes have water rights senior to those of non-Indian users with water rights and access established subsequent to the Indian reservations’ creation. Although many Indian tribes hold senior water rights through their reservations, the quantification of these rights is undetermined in many cases. Tribes have pursued quantification of their water rights through both litigation and negotiated settlements. The settlements involve negotiation between tribes, the federal government, states, water districts, and private water users, among others. They aim to resolve conflict between rights holders and allow the parties to determine specific terms of water allocation and use with certainty. Over the last 50 years, negotiated settlements have been the preferred course for most tribes because they are often less lengthy and costly than litigation. 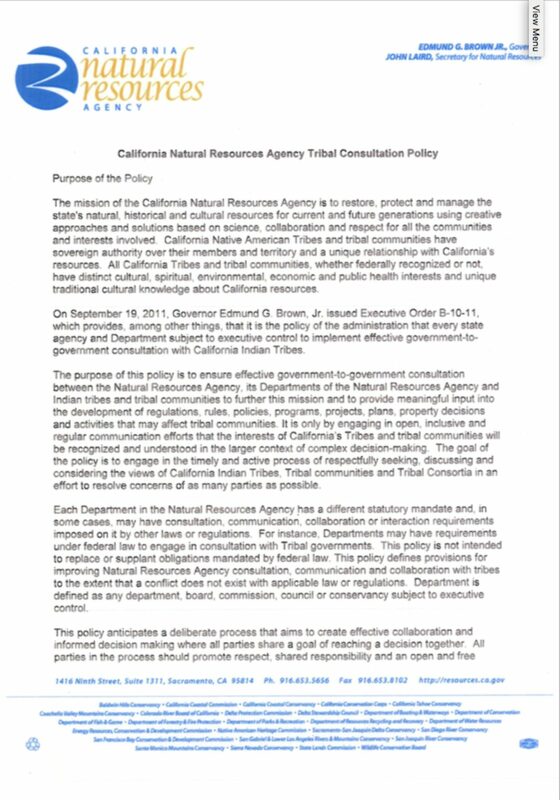 Additionally, many stakeholders have noted that these negotiated agreements are more likely to allow tribes not only to quantify their water rights on paper but also to procure access to these resources in the form of infrastructure and other related expenses, at least in some cases. After being negotiated, approval and implementation of Indian water rights settlements require federal action. As of 2017, 36 Indian water rights settlements have been federally approved. 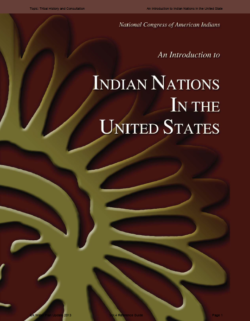 Of these, 32 settlements were approved and enacted by Congress and 4 were administratively approved by the U.S. Departments of Justice and the Interior. 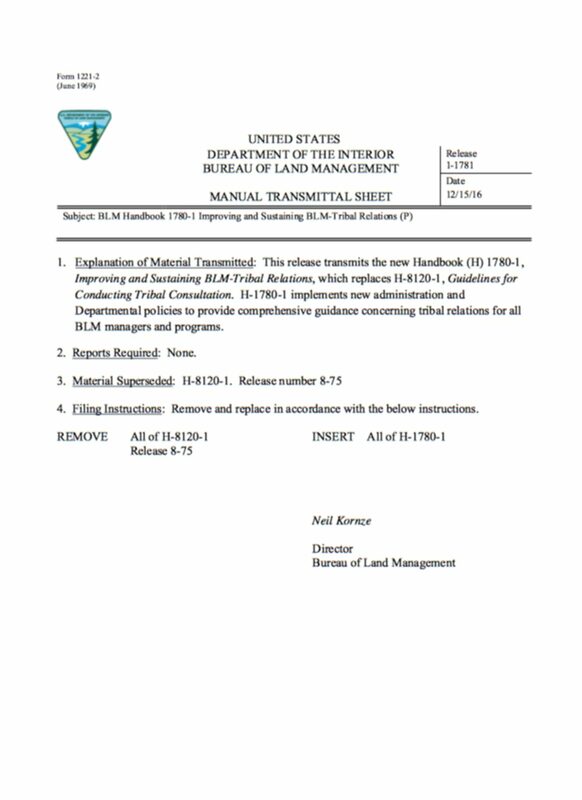 After being congressionally authorized, federal projects associated with approved Indian water rights settlements generally have been implemented by the Bureau of Reclamation or the Bureau of Indian Affairs (both within the Department of the Interior), pursuant to congressional directions. Congress has appropriated discretionary and mandatory funding (and, in some cases, both) for these activities, including in recent appropriations bills. 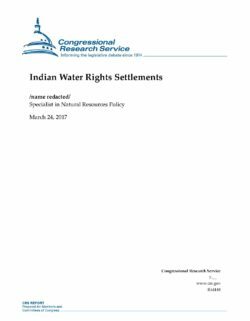 Several Indian water rights settlements have been considered and enacted, including three that were enacted in the 114th Congress. A primary challenge facing new settlements is the availability of federal funds to implement ongoing and future agreements. 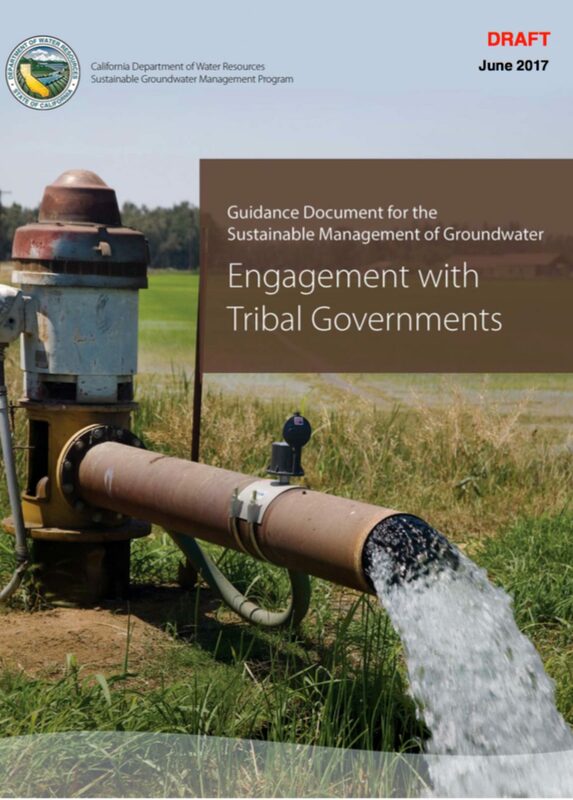 Indian water rights settlements often involve the construction of major new water infrastructure to allow tribal communities to access water they hold rights to, and obtaining federal funding for these projects can be difficult. As a result, some settlements have been renegotiated to reduce their federal costs. At issue for Congress is under what circumstances (if any) to approve new Indian water rights settlements and whether to fund (and in some cases amend) new and ongoing settlements. Some argue that resolution of Indian water rights settlements is a mutually beneficial means to resolve long-standing legal issues, provide certainty of water deliveries, and reduce the federal government’s liability. Others argue against authorization and funding of settlements, either in general or with regard to specific activities associated with individual settlements.